Sitting in your hostel rooms, with your favorite music playing in your big speakers with a little bit of college stuff…life seems fantastic, isn’t it? well why not, you have your dad whose salary has more number of digits than required for a normal sober existence or may be you have most of those materialistic things or maybe just because you think life is about you, just you and the rest of this world may rot in hell, i don’t effing care ! This is an answer to each one of you, who laughed on this bill and made jokes on it and on Anna Hazare. 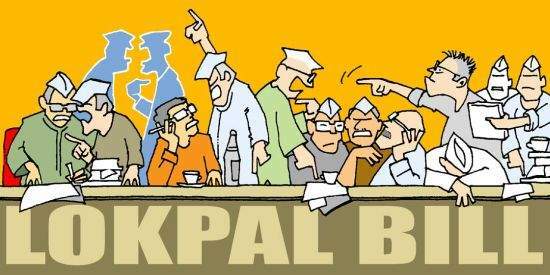 the ones who never tried to understand what this “Jan Lokpal Bill” meant for the people who don’t have the above mentioned inherited privileges. i am not gonna rant about the bill and what it says, because if you haven’t gone through it even once, then i doubt you will ever understand what i am writing, so please INVEST your time somewhere else and leave this page.Thank you. Once i read about the bill and had gathered enough information about its importance(even though i couldn’t understand each and every point mentioned in it)…my heart was filled with respect towards ANNA HAZARE. i still can’t understand how and why some people thought this to be a useless effort in spite of everything the bill had to offer. # i hate to admit it but if you think our country is really developing even though we have so many scams and corrupt netas in our country, then please stop betraying yourself – and that’s what this bill aims to remove ! # just because you never had to feel this sting of corruption cause you were busy playing on your dad’s paycheck then think about those lower class and middle class people who were devoid of several job opportunities cause the managers were already sold out – this bill is our weapon against them ! # just because you feel that the CWG games didn’t include CRICKET, so whatever scams they did behind the last CWG games was fine then think about the country’s economy which would have been much much better if that money made way into the govt funds rather than in some unknown Swiss bank accounts – this bill swears to catch and punish the next RAJA’s and KALMADI’s ! # just because you are more interested in ONLY WATCHING action packed spy movies and TV series , don’t forget there are actually people in this world who rise against these scams and risk their lives for the people, for the country, to expose the culprits – this bill promises to protect all these whistle blowers ! There are many other great aspects of this bill. i thank each one of you who supported this bill, starting from Anna Hazare to Anupam Kher to that unnamed random Indian who took on the streets to show his support and to ask for what he deserved, India without corruption. each one of you who could make it to Jantar Mantar to the ones who started a campaign/march in their city to the ones who supported it online! you can now proudly tell the next Indian generation that you played your part in giving them a better India, a happy India, a corruption free India. THANK YOU! And to those, who thought this to be a joke and another one of those media hypes, you need to figure out the deeper meaning of life and the real meaning of calling your self an Indian. you need to figure out that you don’t just have to feel proud of your country after “WINNING” a cricket match but you have to feel it each and every moment. i don’t doubt your patriotism, i doubt your priorities. Finally, congrats India. Anna Hazare will break his fast in a few hours. together with protests, silent march, online petition, Facebook etc we showed the real strength of unity. more than others, we proved a point to our self. the YOU(TH) proved a point to their souls. we did it…LONG LIVE INDIA, JAI HIND !